Activated alumina, also called aluminum oxide, is used as desiccant, activated alumina drier, adsorbent, catalyst carrier, de-fluorination, etc. Activated alumina has high porous structure, high surface area-to-mass ratio, high pole-molecular absorbent property, high selectivity, high absorbent rate, high resistance to thermal stock, etc. Use desiccant to reduce initial cost, save operating cost and energy consumption. KT Refractories offers high quality activated alumina at the most competitive price! Drying of organic liquids such as LPG, propylene, butene, etc. Drying of steam cracked liquids, cyclohexane, gasoline, chlorine and fluorinated hydrocarbons, aromatic solvents, etc. Drying of air and gases such as cracked gases, catalytic reforming recycle gas, synthesis gas, methyl chloride, natural gas, LNG, etc. Resistant to liquid water - Activated Alumina will not shrink, swell, soften or disintegrate when immersed in water. Water slugging will not fracture the alumina beads. High adsorption capacity of the desiccant can be restored after complete regeneration. High crush strength for minimizing dust formation while loading desiccant into dryer towers. 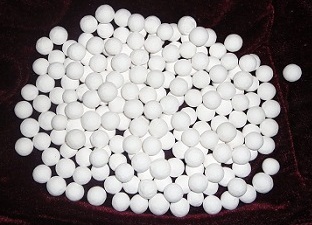 This feature also enables activated alumina to be used as a pre-bed material when other types of desiccants are needed. In regenerative drying systems, activated alumina beds have long service life. Contact KT refractories for Activated Alumina, desiccant, or other refractory raw material because we save you time and money! Call us at 1-877-365-2995 or email us at ConsumerService@KTRefractories.com for your refractory raw material, chemical additives or minerals need! All information in this data sheet is based on indications of the producer and on current knowledge. All information in this data sheet does not represent any guarantee.